A worthy sequel to the much loved BOB Revolution, the flex adds the ability to easily adjust the height of the handle bar which is a necessity for couples that are drastically different heights. Expensive like all of the other BOB strollers but durable and easy to use. Please enjoy our BOB Revolution Flex Review. BOB is the company that came when an airline mechanic and a bike expert meet and decided to create waves in the stroller industry. Since 1994 BOB has been producing quality jogging strollers and has moved on to include infant car seats and a traditional stroller to their lineup. BOB is known for many of their lines such as the IRONMAN and STRIDES. Both are quality jogging strollers that have changed the way people look at strollers. They have won numerous awards over the years from many of the top parenting magazines and organizations. The Valco Baby’s Tri Mode EX is a similar stroller to the BOB Revolution Flex in that it has 3 wheels, easily converts from walking to jogging, have large canopies and are quality strollers. The Tri Mode EX has an advantage in that it offers single-hand reclining that can be placed on any angle from flat to fully upright. It is also suitable for infants without the use of an infant car seat or adapter. While very similar in size when they are assembled, the Tri Mode EX is much smaller when folded at 26 x 29 x 18 inches. The Revolution Flex, however, is much better suited to jogging and is suitable for children up to 70 pounds as opposed to the Tri Mode EX’s 45 pound weight limitation. The BOB Revolution Flex Jogger is a full-sized stroller that can go from a jogger to a more compact 3-wheel standard stroller. As such, it is not small and takes up a lot of room in your trunk. This is unfortunately problematic if you have a small car and you are going shopping. This size is very useful when it comes to your child’s comfort though. Your child will be able to stretch out and can even keep small toys in the pockets on the insides of the seat. Parents will like the pocket on the back of the seat and the oversized basket underneath. They will also like the adjustable handle that can go from 34 inches all the way to 45 inches. For those who are short but have a tall partner, there is no more buying a stroller that fits one of you while the other hurts their back. Wheel Movement: Rear – fixed; Front – lockable swivel that can lock in a forward or back position. The BOB Revolution Flex is full of features and has plenty of useful accessories to allow the stroller to fit your needs. This stroller was made to move whether you are going for a walk in the mall, a jog on a trail, or even a forested path. It uses its large, air-filled wheels, adjustable suspension, and adjustable handle to make sure that both parent and child are comfortable and well-prepared to face anything on their journey. This stroller can be used as either a 3-wheeled normal stroller or as a jogging stroller by simply turning the front wheel around and locking it in the forward position. This means that you can go from a leisurely stroll along the sidewalk until you reach your jogging path and back again without having to switch strollers or lose the ability to make tight turns. Unfortunately, the seat covers do not come off and are not machine washable. This means that the stroller has to be wiped down with a damp cloth and left to dry. While not a huge deal for the most part, this can be a little tricky for those with kids who are still potty training, or for those who let their kids eat or drink in the stroller. As a daily use stroller, the BOB Revolution Flex is the perfect combination of jogging stroller and everyday stroller. Since it can work as both, it saves you having to buy multiple strollers or figure out which you are going to use. The large wheels and adjustable suspension ensure your child is comfortable and secure on your journeys whether you are in the mall or on a trail through the woods. Storing this stroller is easy as it stands up on its own. This is a necessity for anyone with limited space since there is often no room to lie a stroller down taking up the entire entryway closet. You can also purchase a storage back for those times that you need it put away for longer-term storage or travel. This bag helps to ensure the stroller stays dirt, scratch, and dust-free while not in use. There are, however, a couple things that could be improved on. The seat covers should be removable for easier cleaning. This stroller could benefit from a hand-operated brake for when you are jogging. Lastly, this stroller could be less bulky so that you don’t have to choose between the stroller and groceries when you have a smaller trunk. This stroller is designed for parents who want the freedom to choose between the indoors and the outdoors. Since it can seamlessly go from being a jogging stroller to a regular stroller, you do not have to worry about the turning radius that you would have to otherwise. While there are some points of improvement, none of them are major and are more convenience-based. BOB made sure that they met and exceeded all of their user’s needs with this stroller. 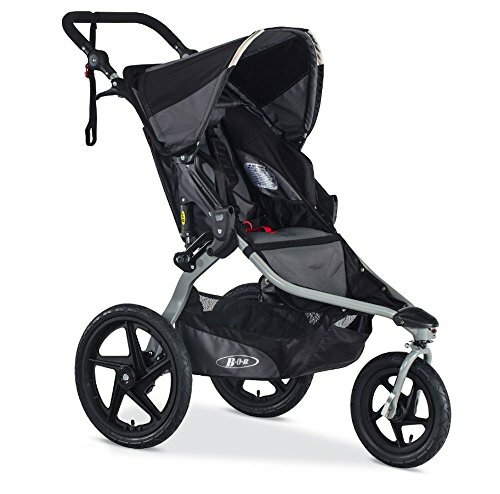 I think this is an excellent buy as it provides everything you want from both regular strollers and joggers. It then adds the little touches that make this stroller stand out. Things like the storage pockets on the inside and back of the seat for both child and parent belongings. It also offers top-of-the-line quality and materials to make sure that its users do not feel that they are lacking anything.